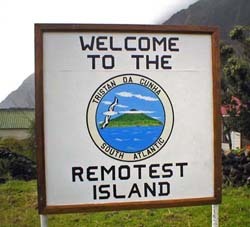 The Lavarello family settled in Tristan Da Cunha island. WebSite to honor to our emigrants and their descendants. Tristan da Cunha, la isla más remota. Tristan settlement is home to 275 islanders, all descended from original settlers (names, dates of arrival & nationality in brackets) and with only seven family surnames surviving amongst present residents: Glass (William 1816 Scotland), Swain (Thomas 1826 England), Green (Peter 1836 Holland), Rogers (Thomas 1836 US), Hagan (Andrew 1849 US), Repetto (Andrea 1892 Italy), Lavarello (Gaetano 1892 Italy). There is a small expatriate population including an Administrator and Doctor with their families. Priests may only stay for a few months, and other visiting professionals (eg dentist, optician) for a few weeks. 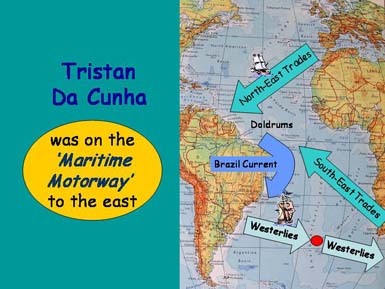 The discovery of Tristan da Cunha was no accident - Tristan was on the preferred route out from Europe to the Indian Ocean in the days of sail. The Dutch East India Company insisted from 1617 that their sea captains zigzagged the Atlantic, picking up the North-East Trade Winds from Europe towards the West Indies, hugging the Brazilian coast where the southerly flowing Brazil Current would prevent them being becalmed in the Equatorial Doldrums, then picking up the reliable westerlies towards the Cape of Good Hope and the Indian Ocean. It was thus that Tristan was on the ‘Maritime Motorway’ of the 17th, 18th and early 19th Centuries. Italy - Chile - Argentina - Brasil - Ecuador - France - Gibraltar - Perú - Tristan da Cunha - Uruguay - U.S.A. The Lavarello's family Genealogy in Tristan da Cunha island. Carlos Lavarello Moya, from Chile.